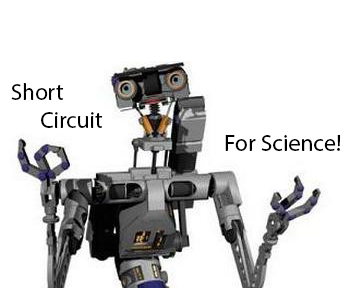 Home Code Basics Short circuit your code, for science! In this example, the second condition doesn’t get evaluated in either case. In the first example, the compiler sees that both conditions have to be true in order for the complete evaluation to be true. Since the first condition is false, then logically, the whole thing is false so the second condition is ignored. In the second example, the compiler sees that either condition can be true for the complete evaluation to be true. Since the first condition is true, then logically, the entire thing is true so the second condition is ignored. Ok great, this is Programming 101 stuff, right? Again, the simplicity of this is just for illustration, but what we’ve done is short-circuited the loop. Since you have to be over the age of 18 in order to be over the age of 21, we’ve concluded that if you’re not over the age of 18, then this logic does not apply to you at all. Next person, please. The continue keyword tells the loop to skip the rest of the body and move on to the next iteration. Short circuit operators and short circuiting loops isn’t all that is short-circuiting. I tend to think of short-circuiting as any logic where you interrupt the logic when a condition fails to apply to that logic. Now, this makes logical sense, especially if you haven’t done this before and/or haven’t had an opportunity to optimize it. Basically you take your number and then you test every number between 1 and your number to see if they divide evenly. If any of them divide evenly, then your number is not a prime number. The problem with this is that it will test every number in the number set which is 2 through 100. If the range were 2 through 1 million, then it would test every number in that set as well. There’s no short-circuit. Let’s take a different approach? How about first, we break it into something a bit more manageable, and then apply some short circuiting. By changing our loop condition to d * d <= number we’re eliminating the squares of the number (and everything above it) which would have been basically testing the same number multiple times. This isn’t a short-circuit per say, but I think it goes along with the “eliminate unnecessary evaluations” theme. I assume your code is C#, if so, & and } are not bitwise operators in a Boolean expression, they are non-short-circuiting logical operators. if (false & DoSomething()) calls DoSomething(). if (false && DoSomething()) does NOT call DoSomething. Well you’re half right. You’re right in that they are “logical operators”, but you are wrong in saying they are not bitwise operators. As per MSDN (and pretty any resource I’ve ever seen — google “bitwise and” and see what you get), they are bitwise when used with integral types and logical when used with boolean operands. But they are still referred to as bitwise operators..
Case in point, go see what 0xFFFF | 0xAAAA comes out to. I bet you it is 0xFFFF. And I bet 0xFFFF & 0xAAAA comes out to 0xAAAA. And I bet you if you do 0xFF ^ 0xFF (bitwise XOR) you’ll get 0. But if it “evaluated” both sides, how could there be more than one bit on either side of the | operator? Because the operator isn’t “calling” anything. It’s comparing 2 values but in order to get to the second value in your scenario, it has to run your function so that it can use its return value (functions can be treated as the value that they return). To further disprove the idea that the operator is “calling” anything, try to do if(true | DoThing()) where DoThing returns void. Not only does it not call, it doesn’t even compile. Yet, if(true | null) *does* compile. In fact true | null = true and true & null = null. Why? Because void is a type and null is a value. Sure, double the operators gives you a short-circuit (I think everyone knows that), but I’m trying to think of a (good) scenario where you’d want to force it into ‘logical mode” and evaluate both sides by using a bitwise operator with boolean operands. If I ever saw your example in production C# code, it’d never make it through code review because that is just plain bad code. So what you’ve described is not what the operator is, but rather how the compiler gets around to using it. Using a bitwise/logical operator as a way to “not short-circuit” is a hack, not a definition.